Cato Institute scholars Patrick Michaels and Chip Knappenberger have produced a layman-friendly yet thoroughly referenced draft report summarizing “the important science that is missing from Global Climate Change Impacts in the United States,” a U.S. Government document underpinning the EPA’s December 2009 endangerment rule, the foundation of all of the agency’s greenhouse gas (GHG) regulations. Pat and Chip’s draft report, titled Addendum: Climate Change Impacts in the United States, is a sober antidote to the climate fear-mongering patronized by the Obama administration, mainstream media, the U.N., corporate rent seekers, and the green movement. Among the best features are the numerous graphics, some of which I will post here. Taking these in no particular order, let’s begin with the scariest part of Al Gore’s “planetary emergency”: sea-level rise. 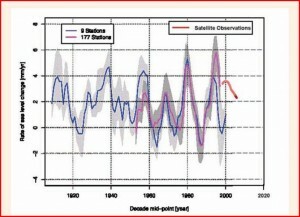 Is the rate of sea-level rise dangerously accelerating? No. 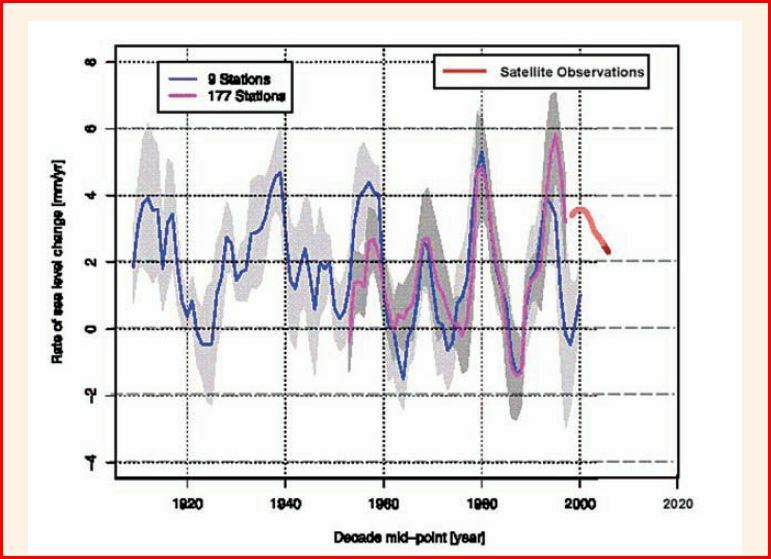 Over the 20th century, there was considerable decadal variation in the rate of sea-level rise but no long-term trend. 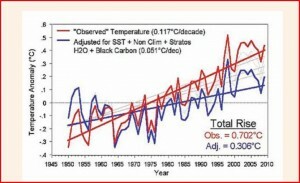 The UN IPCC Fouth Assessment Report (2007) famously concluded that “most of the observed increase in global average temperature since the mid-20th century is very likely due to the observed increase in anthropogenic greenhouse gas concentrations.” However, recent studies attribute components of the observed warming to other factors. 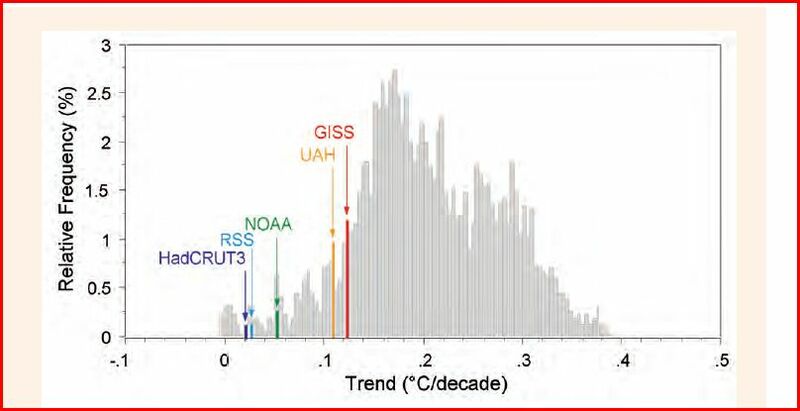 Adding up those contributions, Pat and Chip calculate that greenhouse gas concentrations account for less than half of the observed warming since 1950. Climate models typically overestimate actual warming, indicating that they overestimate climate sensitivity (the amount of warming resulting from a given increase in GHG concentrations). During the 15 year period from 1997-2011, the observed rate of global warming as derived from the five major compilations of global average surface temperatures (GISS (red), NOAA (green), Hadley Center (dark blue), MSU satellite—University of Alabama version (yellow) and MSU satellite (Remote Sensing Systems version (light blue) falls out in the left-hand tail of the distribution of model projected trends of the same length (grey bars). 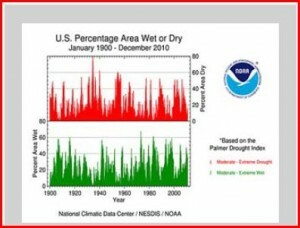 Is the recent Midwest drought evidence that our fuelish ways are destabilizing the climate system? No. 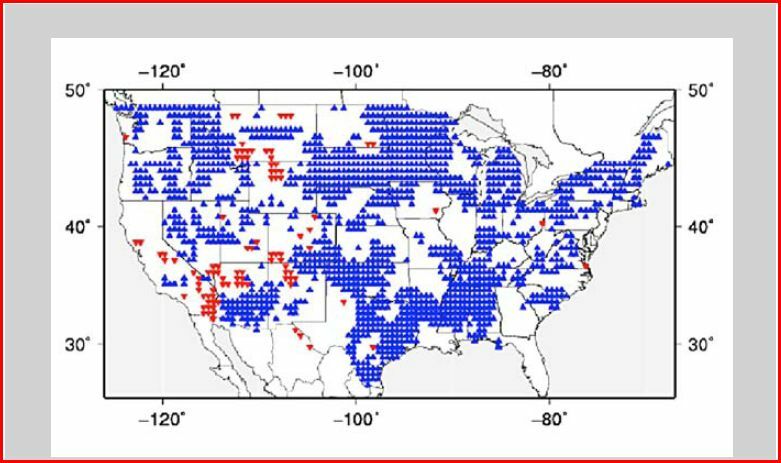 There is no long-term trend in U.S. soil moisture such as might be correlated with the increase in atmospheric GHG concentrations. 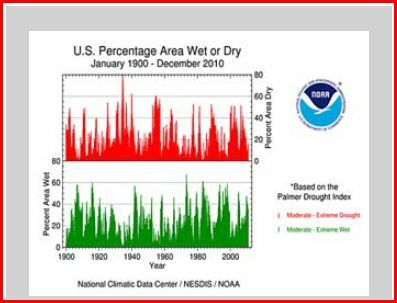 The Palmer Drought Severity Index (PDSI) shows no trend in the area of the nation experiencing drought or excessive wetness over the period of record that begins in 1895. 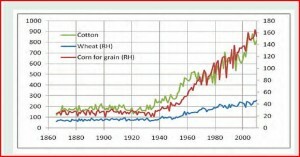 In fact, throughout the U.S., soil moisture in the 20th century increased in more areas than it declined. Okay, but as the world warms (and as urban heat islands expand), there are going to be more heat waves, and more people will die, right? Yes and no. “Mortality from heat waves declines as heat wave frequency increases, and deaths from extreme cold decline dramatically as cold air preferentially warms.” Cities with the most frequent hot weather, such as Phoenix, AZ and Tampa, FL, have virtually no heat-related mortality. Is global warming spinning up ever more powerful tropical cyclones? 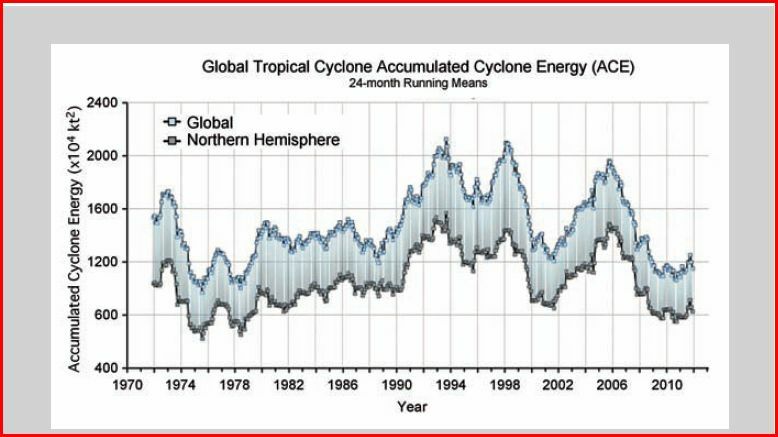 In the Atlantic Basin, there has been no long-term trend in the accumulated cyclone energy (ACE) index (which combines the duration and intensity of each storm into a seasonal total). Accumulated Cyclone Energy (ACE) index for the Atlantic Basin from 1851 through 2010. There is obviously no relationship to long-term temperature rise or GHG concentrations. Data available at http://www.aoml.noaa.gov/hrd/tcfaq/E11.html. Nor has there been a long-term increase in ACE globally since 1970. Is global warming altering wind patterns such that more hurricanes are striking the U.S.? 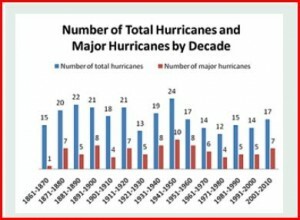 There has been no long-term trend in the number of hurricanes and major (category 3-5) hurricanes making landfall in the U.S. 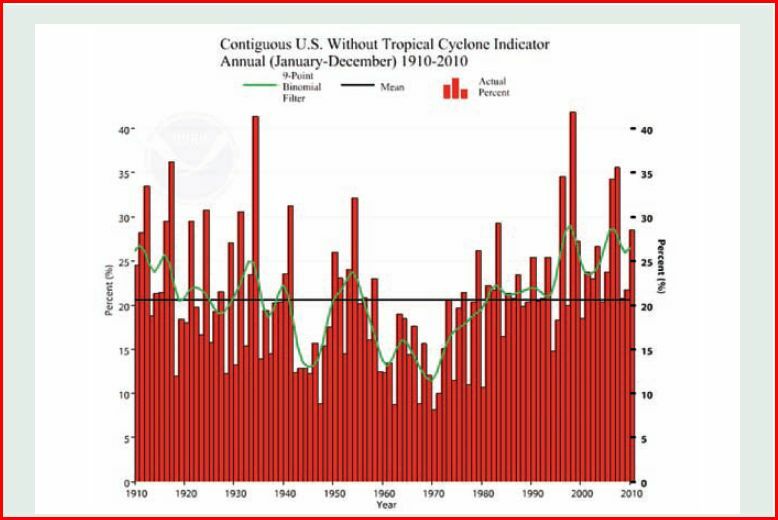 Climate extreme index, not counting tropical storms and hurricanes, 1920-2010. Source: Gleason, K.L., et al., 2008: A revised U.S. Climate Extremes Index. Journal of Climate, 21, 2124-2137. 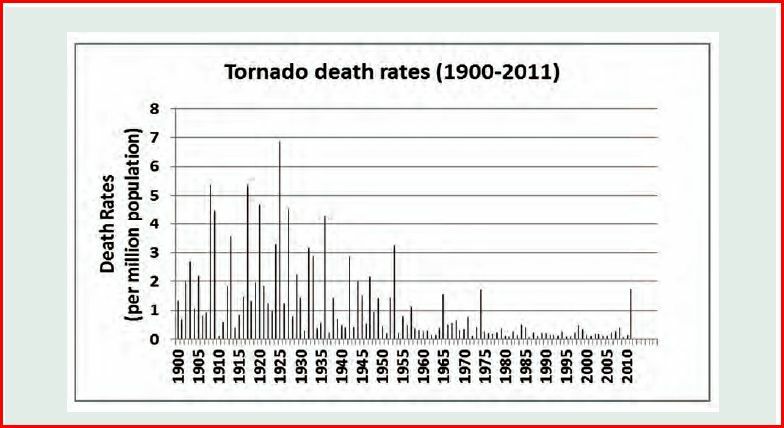 But surely, tornadoes are more frequent now than ever, and what else can explain this except the increase in GHG concentrations? Actually, it’s the ability to detect small tornadoes that has increased. If we consider just the large tornadoes (F3-F5) that have been detectable for decades, there is no trend. Number of strong U.S. tornadoes, 1950–2011. 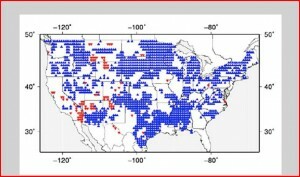 Source: NCDC, U.S. Tornado Climatology, 7 March 2012, at http://www.ncdc.noaa.gov/oa/climate/severeweather/tornadoes.html, visited 11 May 2012. But tornadoes are killing more people, right? Nope. 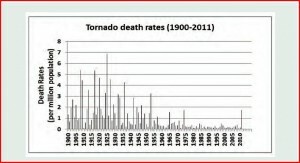 U.S. tornado death rate, 1900–2011. 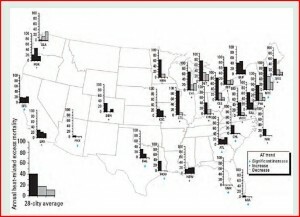 Sources: Updated from Goklany (2009a), using USBC (2011); NWS, Hazard Statistics at http://www.weather.gov/os/hazstats.shtml, accessed May 11, 2012; NWS, Storm Prediction Center, Annual U.S. Killer Tornado Statistics, at http://www.spc.noaa.gov/climo/torn/fataltorn.html, accessed May 11, 2012. Hurricane damages keep going up and up, but that’s due to the ongoing rise in population and development in coastal areas. 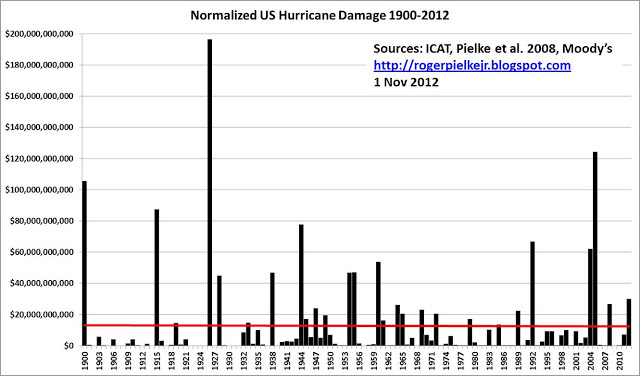 When hurricane damage is adjusted for changes in population, wealth, and inflation, there is no long-term trend. 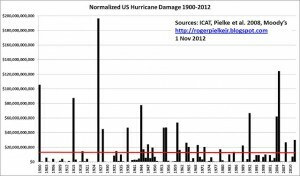 U.S. tropical cyclone damage adjusted for inflation, population growth and wealth, 1900-2012 [Note – I am using a more updated graph than the one appearing in Addendum. Source: Pielke et al. 2008. 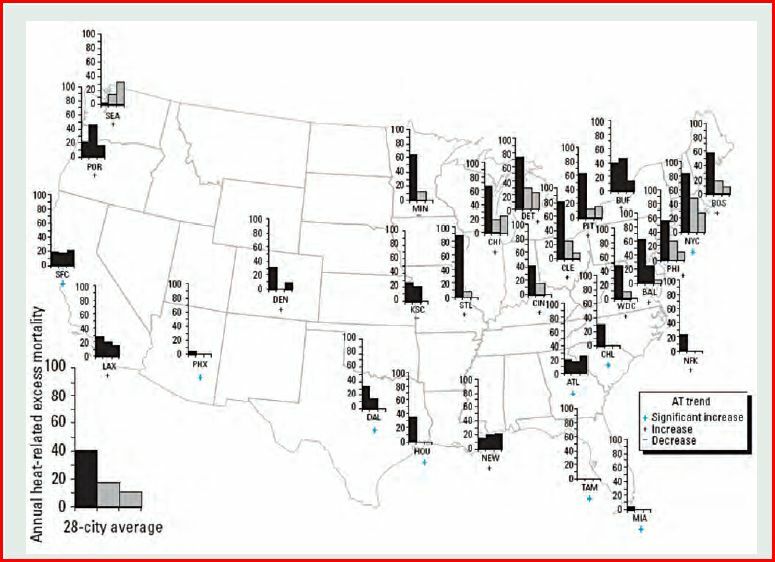 Normalized Hurricane Damage in the United States: 1900-2005, Natural Hazards Review, DOI: 10.1061/1527-6988, 9:1(29), updated 12/31/2012]. Okay, but warmer temperatures mean more photo-chemical smog and worse air pollution, right? 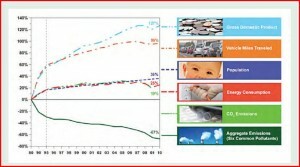 Only if air pollutant emissions stay the same, but emissions have declined on average by 67% since 1980. 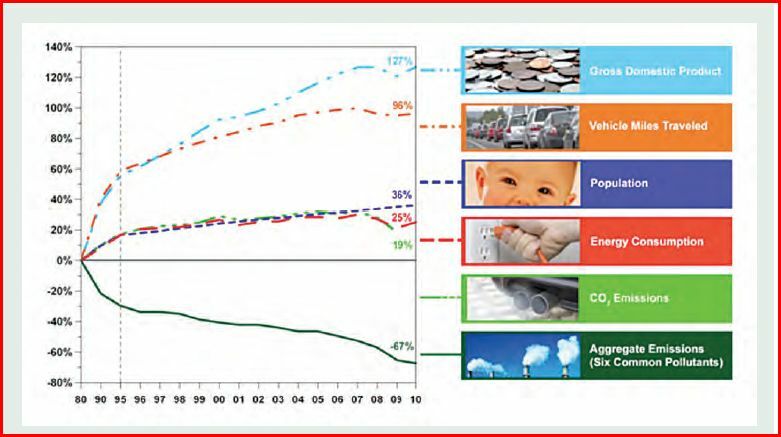 Further declines are projected as auto fleets and capital stock are replaced by newer, cleaner models. 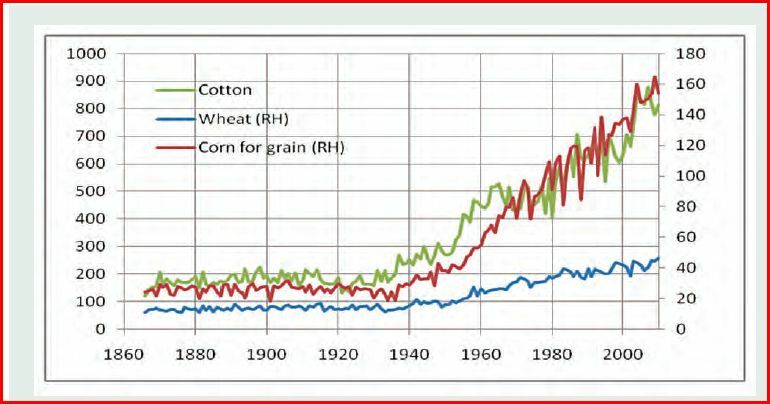 Whatever risks climate change may pose to U.S. agriculture in the future, warming historically has not been associated with reductions in crop yield. Remember the U.N. 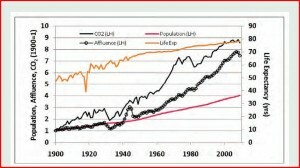 Environment Program’s (UNEP) November 2005 prediction that there would be as many as 50 million climate refugees by 2010? Not only did those displaced populations fail to materialize, some of the areas UNEP supposed would be hardest hit by climate change impacts experienced rapid population increases. Something similar is going on right here in the USA. 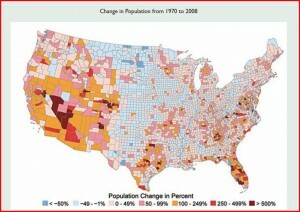 Decade by decade, millions of Americans vote with their feet to live in warmer climates. 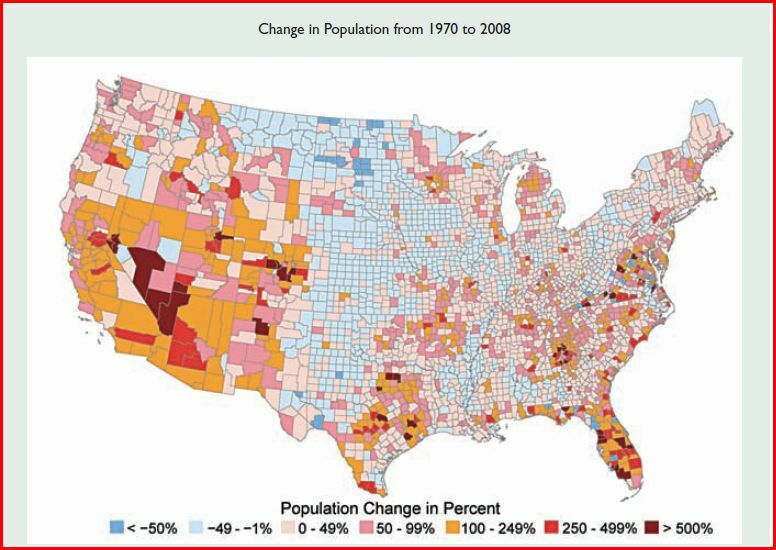 U.S census data show that the largest percent increases in population are in the relatively dry and hot Pacific Southwest, the moist and hot southeast Texas, and the Florida peninsula. But ‘everybody knows’ that global warming is the worst threat facing humanity. 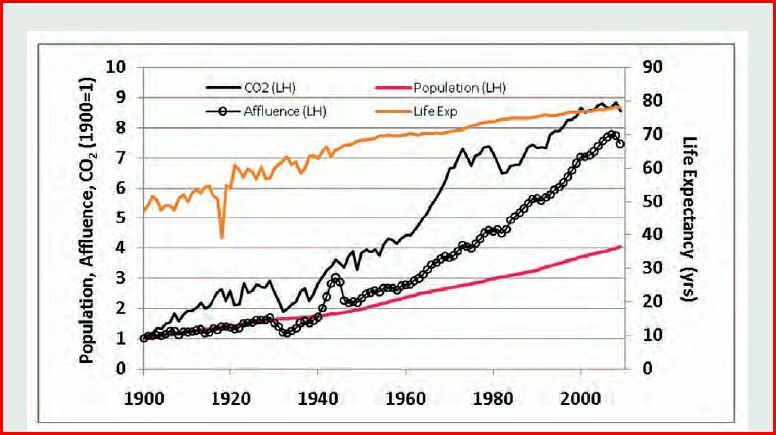 Okay then explain this: Why do U.S. (and global) population, per capita income, and life expectancy keep rising along with carbon dioxide emissions? Next post: President Obama’s Inaugural Speech: New Heat on Warming?